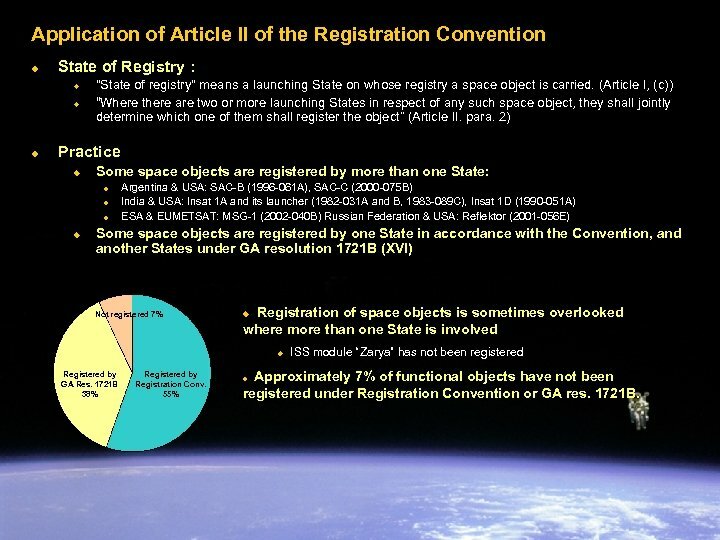 Historical Overview : General Assembly resolution 1721 B (XVI) u u u In fact there are two separate, yet complementary registers on objects launched into outer space. First register established in 1961 in accordance with GA resolution 1721 B (XVI) of 20 December 1961. Still used to disseminate information received from Member States who are not party to the Registration Convention. u The most recent submission was from Nigeria in 2004. (A/AC. 105/INF. 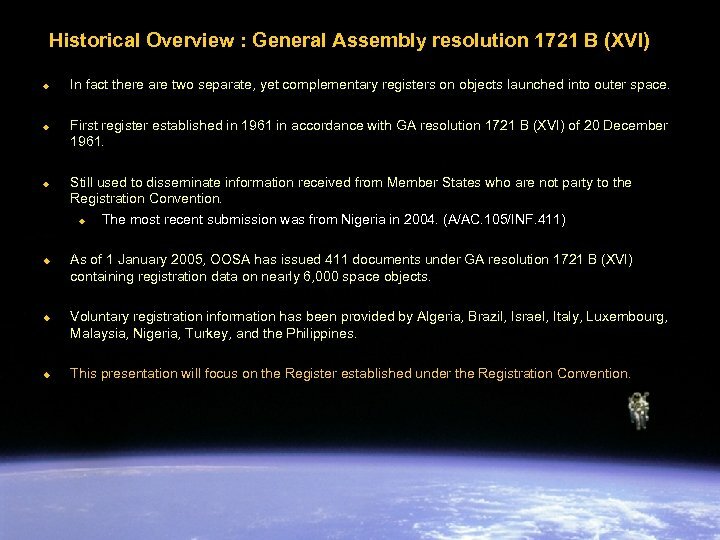 411) As of 1 January 2005, OOSA has issued 411 documents under GA resolution 1721 B (XVI) containing registration data on nearly 6, 000 space objects. Voluntary registration information has been provided by Algeria, Brazil, Israel, Italy, Luxembourg, Malaysia, Nigeria, Turkey, and the Philippines. This presentation will focus on the Register established under the Registration Convention. 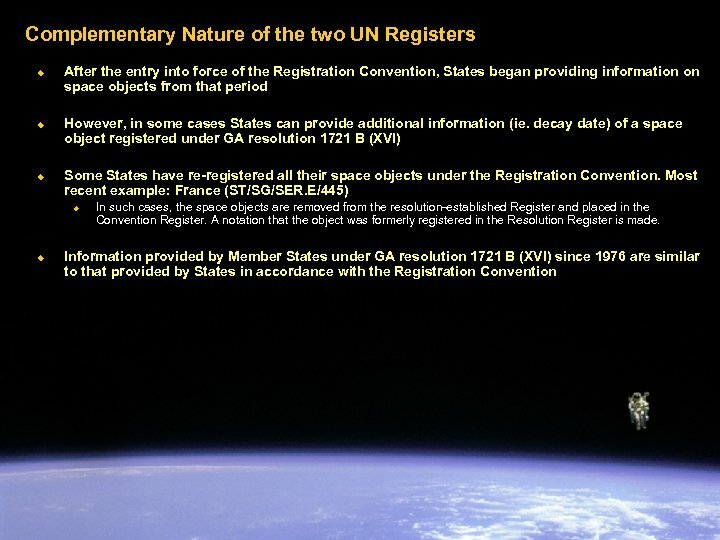 Registration Convention u u Adopted by the UN General Assembly: 12 November 1974 (resolution 3235 (XXIX)), u Opened for signature on 14 January 1975, entered into force on 15 September 1976, u Supersedes General Assembly resolution 1721 (XVI) B of 20 December 1961. As of 1 January 2005, there were 45 ratifications and 4 signatures: u Antigua and Barbuda, Argentina, Australia, Austria, Belarus, Belgium, Bulgaria, Burundi (Signature only), Canada, Chile, China, Cuba, Cyprus, Czech Republic, Denmark, France, Germany, Greece, Hungary, India, Indonesia, Iran (S), Japan, Kazakhstan, Liechtenstein, Mexico, Mongolia, Netherlands, Nicaragua (S), Niger, Norway, Pakistan, Peru, Poland, Republic of Korea, Russian Federation, Saint Vincent and the Grenadines, Seychelles, Singapore (S), Slovakia, Spain, Sweden, Switzerland, Ukraine, United Arab Emirates, United Kingdom, United States of America, Uruguay, Yugoslavia. u Most recent ratification by Greece in May 2003. 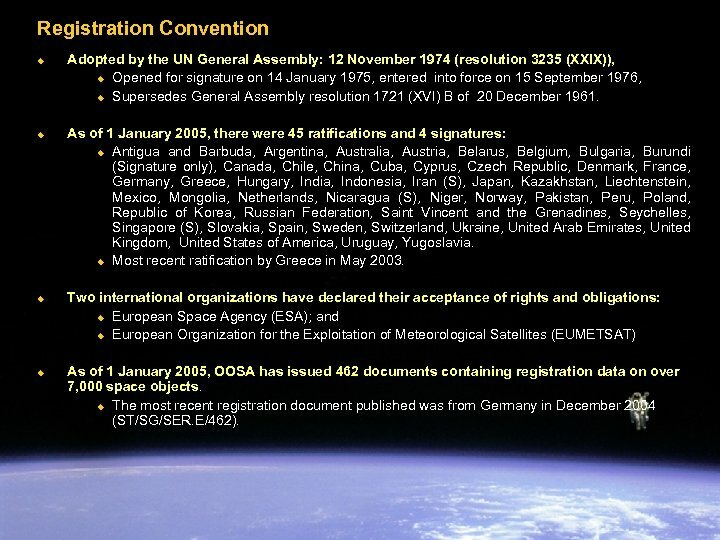 Two international organizations have declared their acceptance of rights and obligations: u European Space Agency (ESA); and u European Organization for the Exploitation of Meteorological Satellites (EUMETSAT) As of 1 January 2005, OOSA has issued 462 documents containing registration data on over 7, 000 space objects. u The most recent registration document published was from Germany in December 2004 (ST/SG/SER. E/462). 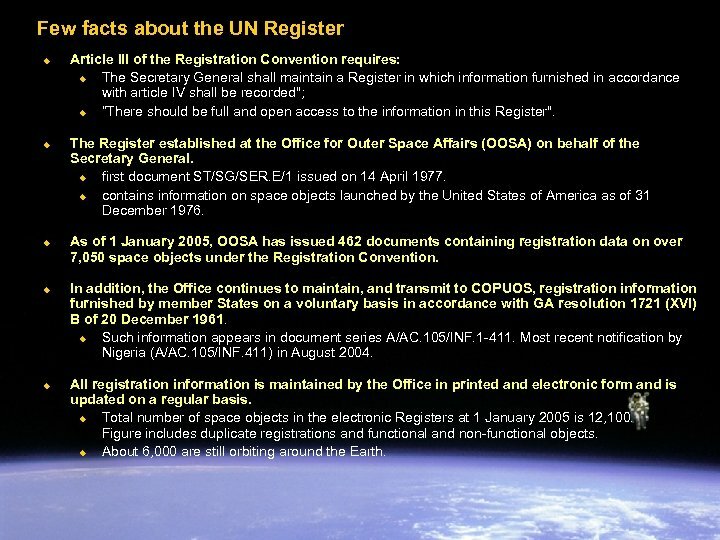 Few facts about the UN Register u u u Article III of the Registration Convention requires: u The Secretary General shall maintain a Register in which information furnished in accordance with article IV shall be recorded"; u “There should be full and open access to the information in this Register". The Register established at the Office for Outer Space Affairs (OOSA) on behalf of the Secretary General. u first document ST/SG/SER. E/1 issued on 14 April 1977. u contains information on space objects launched by the United States of America as of 31 December 1976. 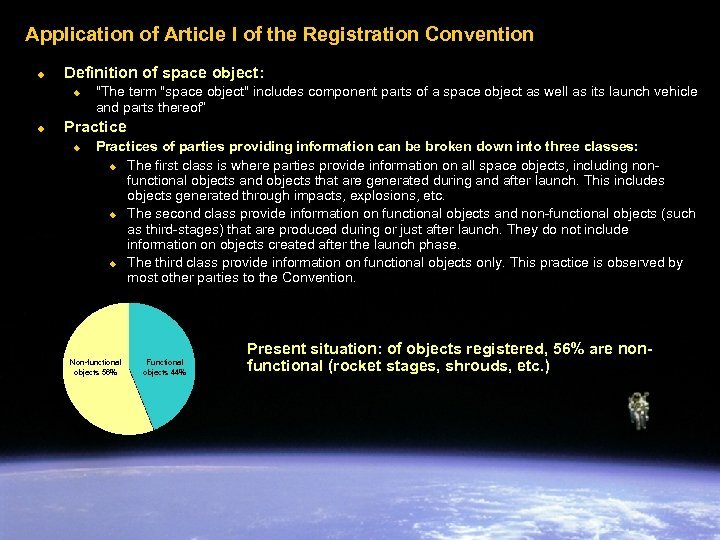 As of 1 January 2005, OOSA has issued 462 documents containing registration data on over 7, 050 space objects under the Registration Convention. In addition, the Office continues to maintain, and transmit to COPUOS, registration information furnished by member States on a voluntary basis in accordance with GA resolution 1721 (XVI) B of 20 December 1961. u Such information appears in document series A/AC. 105/INF. 1 -411. Most recent notification by Nigeria (A/AC. 105/INF. 411) in August 2004. All registration information is maintained by the Office in printed and electronic form and is updated on a regular basis. 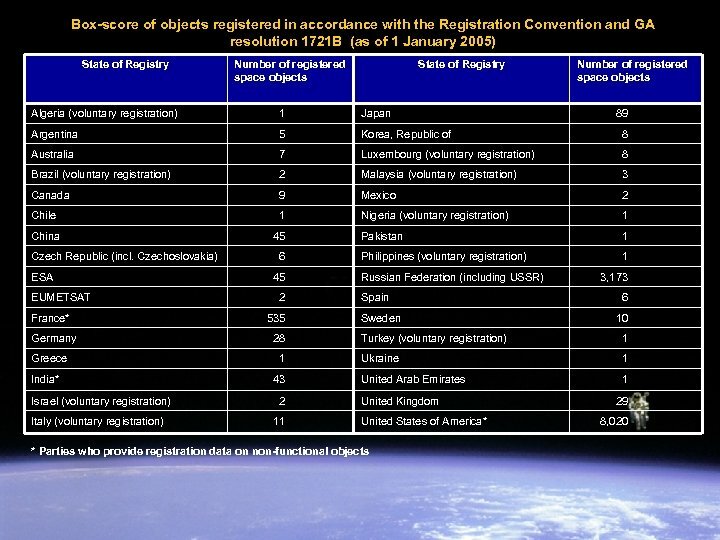 u Total number of space objects in the electronic Registers at 1 January 2005 is 12, 100. Figure includes duplicate registrations and functional and non-functional objects. u About 6, 000 are still orbiting around the Earth. 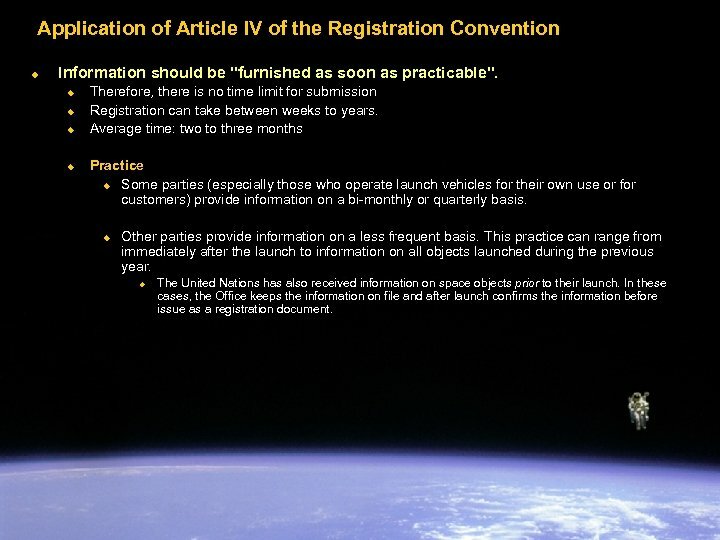 Application of Article IV of the Registration Convention u Information should be "furnished as soon as practicable". u u Therefore, there is no time limit for submission Registration can take between weeks to years. Average time: two to three months Practice u Some parties (especially those who operate launch vehicles for their own use or for customers) provide information on a bi-monthly or quarterly basis. u Other parties provide information on a less frequent basis. This practice can range from immediately after the launch to information on all objects launched during the previous year. 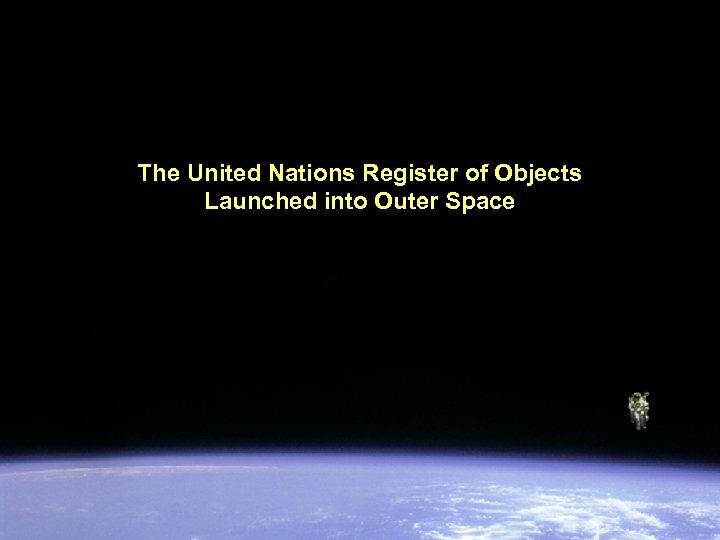 u The United Nations has also received information on space objects prior to their launch. In these cases, the Office keeps the information on file and after launch confirms the information before issue as a registration document. 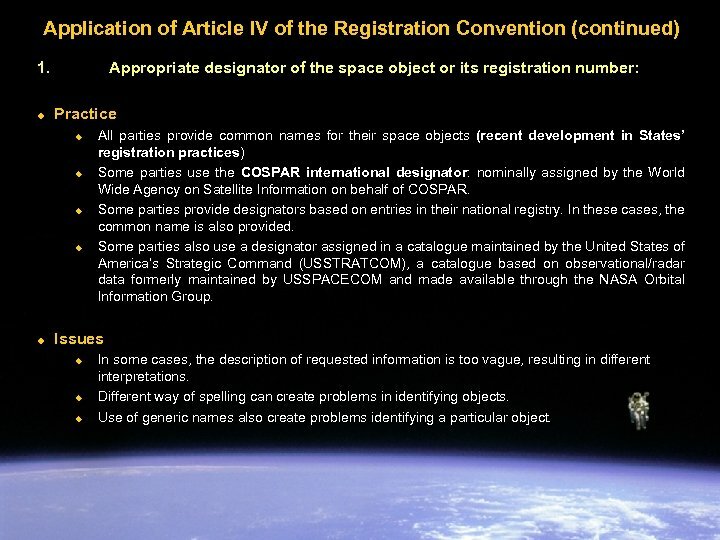 Application of Article IV of the Registration Convention (continued) 1. u Appropriate designator of the space object or its registration number: Practice u u u All parties provide common names for their space objects (recent development in States’ registration practices) Some parties use the COSPAR international designator: nominally assigned by the World Wide Agency on Satellite Information on behalf of COSPAR. Some parties provide designators based on entries in their national registry. In these cases, the common name is also provided. Some parties also use a designator assigned in a catalogue maintained by the United States of America’s Strategic Command (USSTRATCOM), a catalogue based on observational/radar data formerly maintained by USSPACECOM and made available through the NASA Orbital Information Group. Issues u u u In some cases, the description of requested information is too vague, resulting in different interpretations. Different way of spelling can create problems in identifying objects. Use of generic names also create problems identifying a particular object. 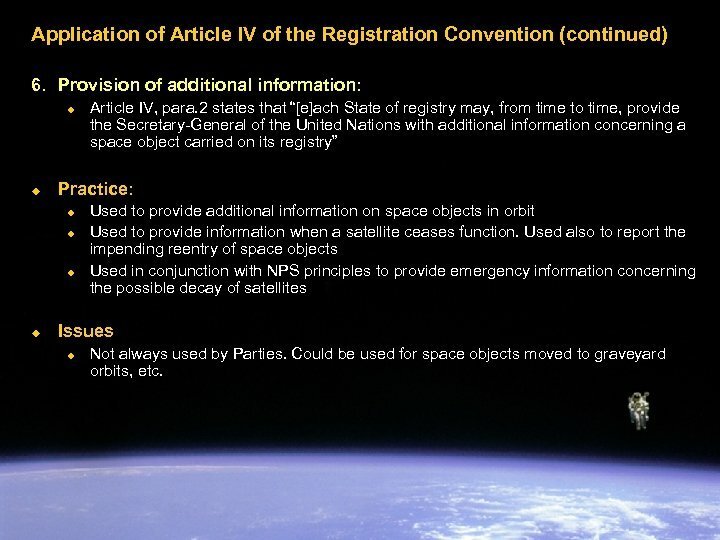 Application of Article IV of the Registration Convention (continued) 2. Date of the launch u Practice u u u Some parties use Greenwich Mean Time (GMT) also called Universal Time, Coordinated (UTC). Some parties use local time at the place of launch. Issues u u Some difficulty in identifying space objects based on local time of launch. Identifying a space object when the time registered may be +/- 1 day out. 3. Territory or location of launch: u Practice u u Some parties provide location and territory of launch, especially if the object is launched from the territory of another State. 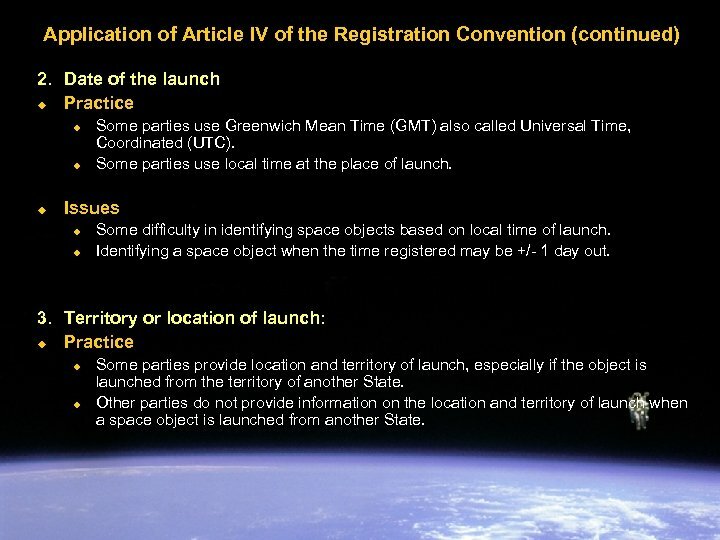 Other parties do not provide information on the location and territory of launch when a space object is launched from another State. 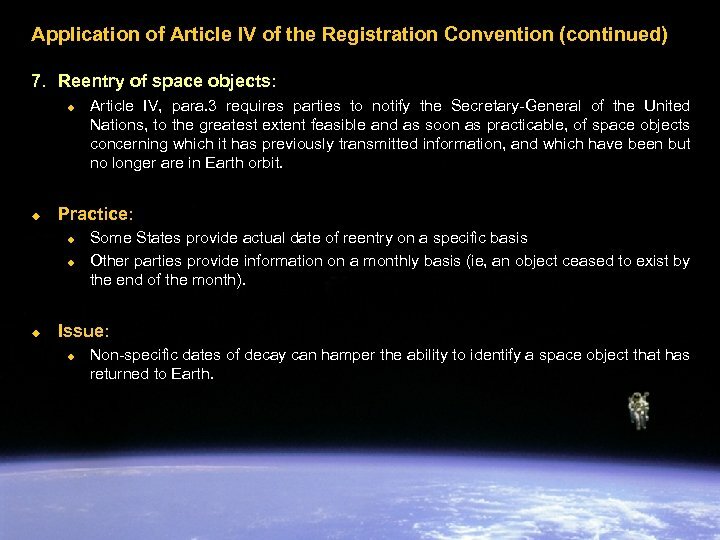 Application of Article IV of the Registration Convention (continued) 4. Basic orbital parameters (continued): u Practice: u u u Some States provide initial orbit, others intermediate (parking) orbit and still others the final operational orbit. Units used for orbital parameters (km, minutes, degrees) can vary Data on apogee, perigee - usually provided are heights above the Earth surface, but sometimes distance from the centre of the Earth (difference of 6, 378 km!). Orbital data is sometimes also provided on objects beyond Earth’s orbit, such as interplanetary probes; Some parties provide the location in GSO. Issues u u Orbital data may not always reflect a space objects operational orbit (ie. 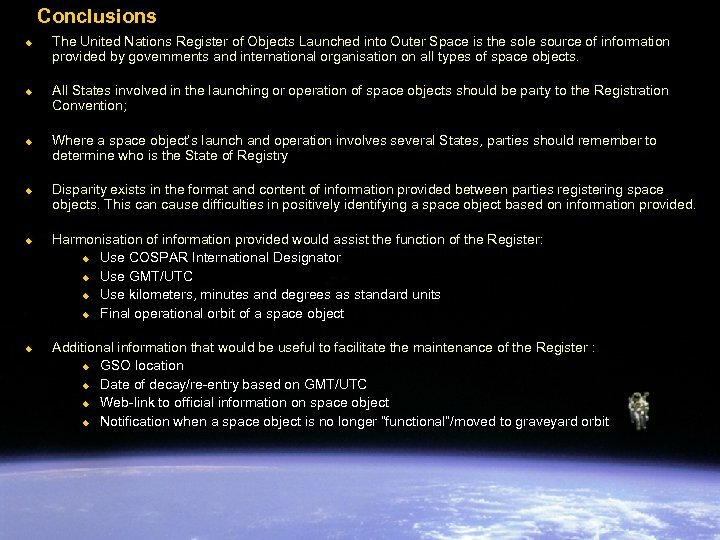 , objects that are in GSO may be registered with a transfer orbit) Different units (ie. km/miles/AU, minutes/days) are used for reporting the orbital parameters. 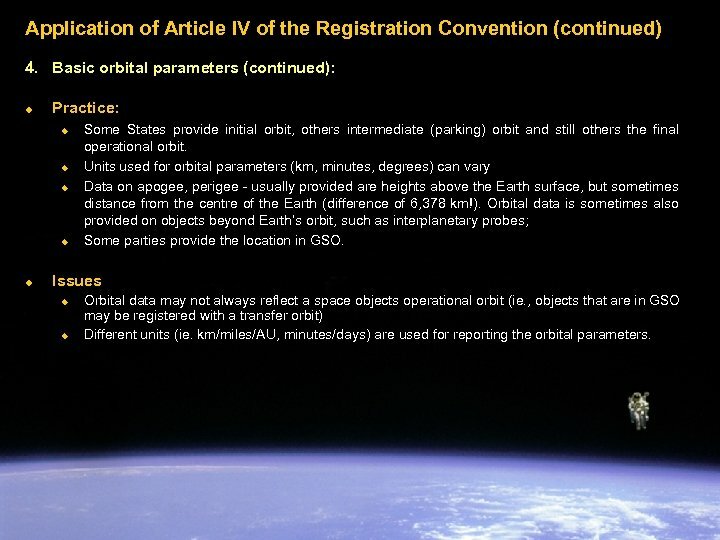 Application of Article IV of the Registration Convention (continued) 5. General function: u Practice: u u Some States provide generic functions with minimal information content Other parties provided detailed information including frequency plans, etc. 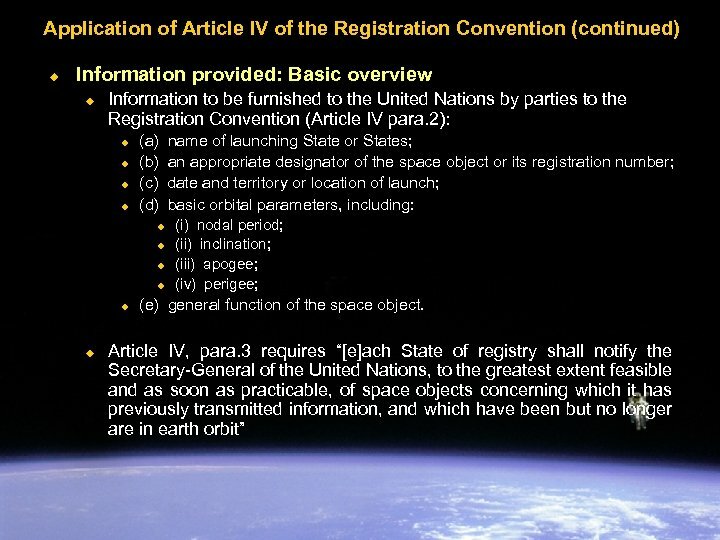 Application of Article IV of the Registration Convention (continued) 6. Provision of additional information: u u Practice: u u Article IV, para. 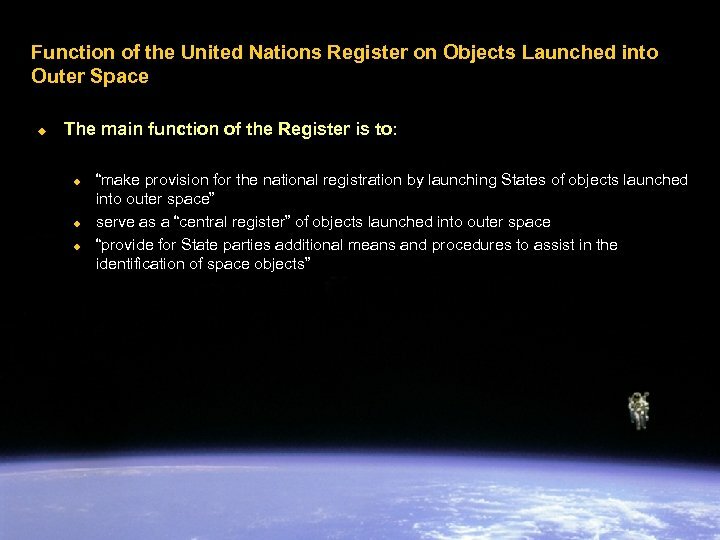 2 states that “[e]ach State of registry may, from time to time, provide the Secretary-General of the United Nations with additional information concerning a space object carried on its registry” Used to provide additional information on space objects in orbit Used to provide information when a satellite ceases function. Used also to report the impending reentry of space objects Used in conjunction with NPS principles to provide emergency information concerning the possible decay of satellites Issues u Not always used by Parties. Could be used for space objects moved to graveyard orbits, etc. 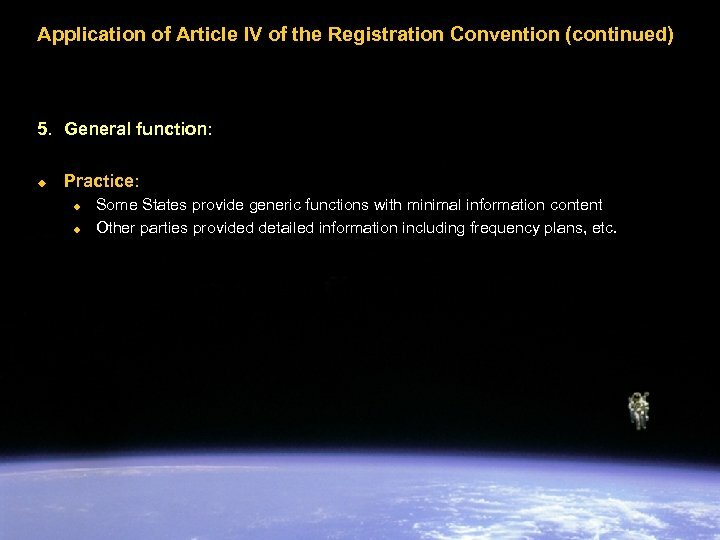 Application of Article IV of the Registration Convention (continued) 7. Reentry of space objects: u u Practice: u u u Article IV, para. 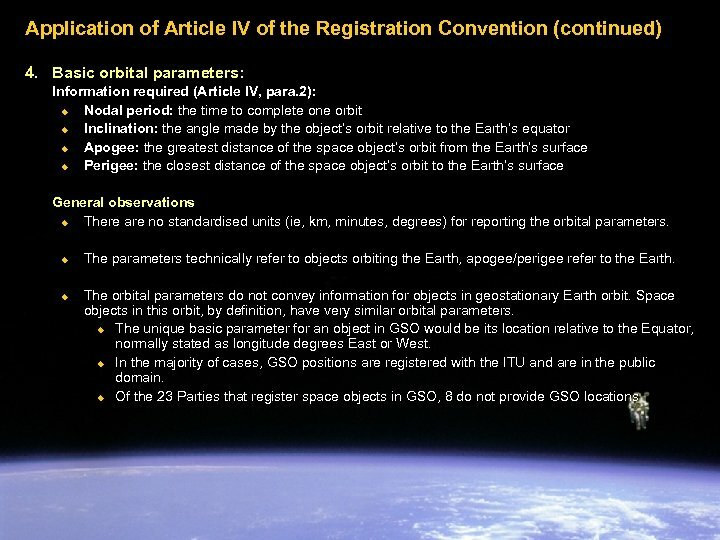 3 requires parties to notify the Secretary-General of the United Nations, to the greatest extent feasible and as soon as practicable, of space objects concerning which it has previously transmitted information, and which have been but no longer are in Earth orbit. Some States provide actual date of reentry on a specific basis Other parties provide information on a monthly basis (ie, an object ceased to exist by the end of the month). Issue: u Non-specific dates of decay can hamper the ability to identify a space object that has returned to Earth. 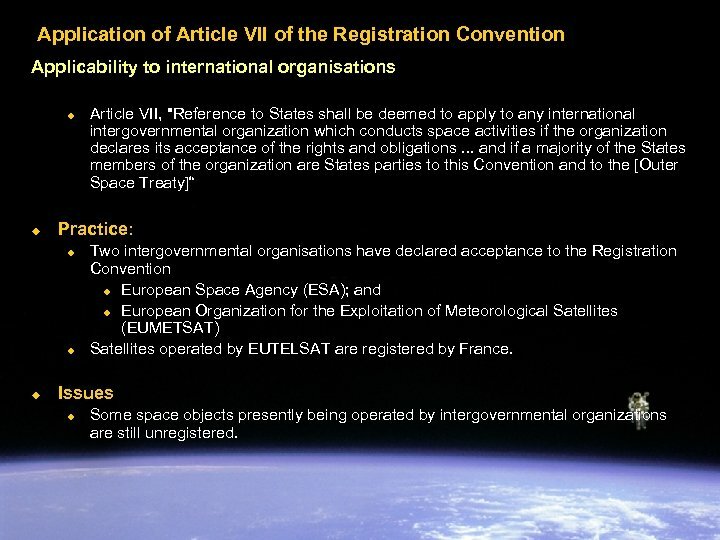 Application of Article VII of the Registration Convention Applicability to international organisations u u Practice: u u u Article VII, "Reference to States shall be deemed to apply to any international intergovernmental organization which conducts space activities if the organization declares its acceptance of the rights and obligations. 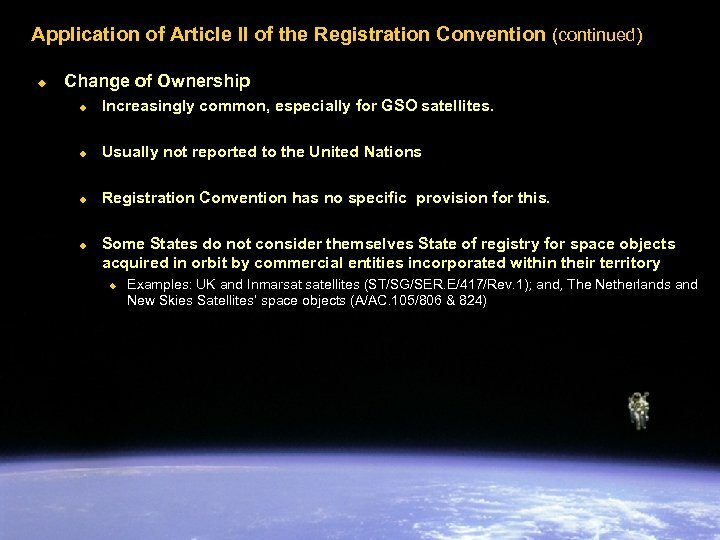 . . and if a majority of the States members of the organization are States parties to this Convention and to the [Outer Space Treaty]“ Two intergovernmental organisations have declared acceptance to the Registration Convention u European Space Agency (ESA); and u European Organization for the Exploitation of Meteorological Satellites (EUMETSAT) Satellites operated by EUTELSAT are registered by France. 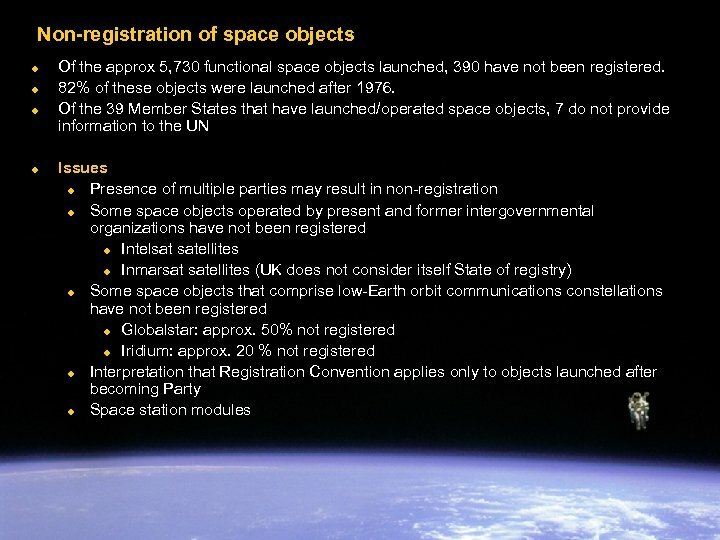 Issues u Some space objects presently being operated by intergovernmental organizations are still unregistered.